This picture book of linguistic oddities sold out immediately. 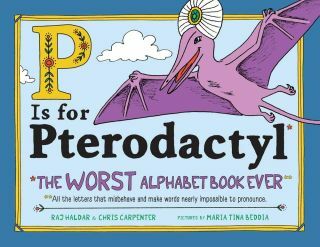 Silent letters are celebrated in P is for Pterodactyl, a funny new picture book that describes itself as 'the worst alphabet book ever'. Instead of relying on the traditional 'a is for apple', this book explores "all the words that misbehave and make words nearly impossible to pronounce," so expect to find lots of Czars, tsunamis, and mnemonics. Given that the English language is notorious for its contrary rules and counter-productive etiquettes, it's amazing that we haven't seen a mischievous book like P is for Pterodactyl on our list of 31 books graphic designers should read. And even though the words it uses to represent letters have a very limited use, they aren't technically wrong. The brainchild of Raj Haldar, AKA rapper Lushlife, and computer programmer Chris Carpenter, P is for Pterodactyl features illustrations by Maria Tina. Published by Sourcebooks, the book has become a surprise runaway success with the first print run of 10,000 selling almost immediately. This didn't do anything to slow down the book's popularity though as it was soon picked up and shared by Facebook group Imagination Soup. At the time of writing, Sourcebooks reports that more than 100,000 orders for the book have gone unfulfilled, but the good news is that it's busy working on reprinting another 210,000 copies. P is for Pterodactyl is currently sitting pretty at number 8 on the New York Times bestseller list, not bad for a book that started out as a joke about a Q is for Quinoa flashcard. Want a copy of P is for Pterodactyl to call your own? More copies are expected to become available this month.